My crochet hook hates me. 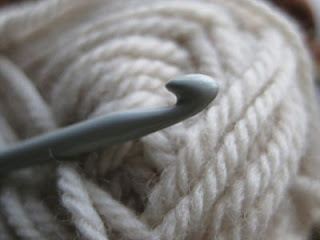 Every time I go to use the crochet hook, it is either missing or it falls off the ball of wool onto the floor. It must see me coming and runs & hides. And I have given up looking for it. But my partner has taken on the duty of finding it. As soon as he hears me mumble "that damn hook", he stops what he is doing and comes and finds it - no questions asked! My hook may hate me, but my partner loves me! Thanks for stopping by and giving me such much needed encouragement! You and I seem to have the same hook problem. Awww. He he. Perhaps your hook is just feeling used. Does it have other hooks to hang out with when you're not using it?? He he. perhaps you need to have a little word with it. Thanks Rie for following Driftwood & Chandelier. I'd love to be so good at crocheting but trying to teach myself how to make little flowers frustrates me as every single one turns out different. Looking forward to reading more of your blog. Giveaway.....come and try your luck!